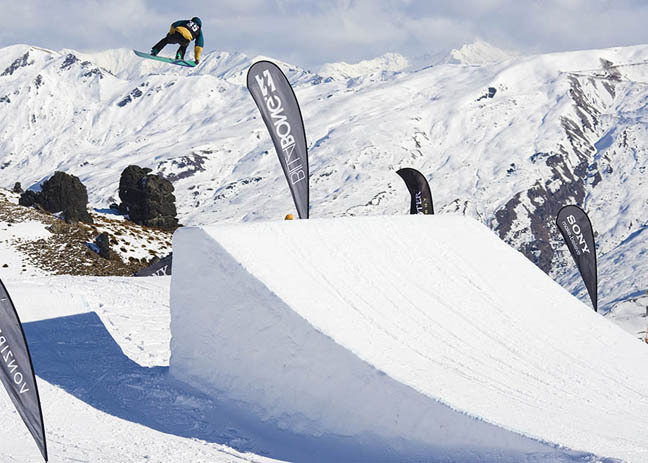 Roopi Tonteri of Finland and Jamie Anderson of the USA dominated today’s Slopestyle event at Snow Park NZ, the first stop of the TTR World Tour in New Zealand for the winter calendar. In the gloomy hours of the morning at Snow Park NZ as snow, wind and rain pelted the mountain and riders arrived running for cover to the riders meeting for finals day, no one could have imagined the how completely opposite the day would turn. By 9:30 am sun was piercing through and 5-10cm of fresh powder and riders that made final day were adjusting their speed and tricks on the icy but nicely manicured course, while the punters and other hangers-on where slashing the wind drifts and powder stashes around the mountain. “Speed is a bit of a mystery”, said Antti Autti of Finland after practice. Antti, 26 and now a veteran in Slopestyle, was even having problems with nailing the tricky conditions. And rightly so ¬- by the end of practice a fair few knuckles were being force-fed to riders who were coming up short on the monster third 70-foot kicker, but some were making smart adjustments to their runs to compensate and all competitors were in the same boat with the conditions so most were happy start the event – well at least those who remembered to wax their boards. 19-year old Aussie Nick Wood was the only 1 of 2 down under riders to compete in the finals. Ending up 10th overall his clean combination of techincal tricks made some heads turn. The three run (best run counts) format gave the riders a chance at really dialing their runs. Antti set the pace during the first run setting the pace with a cab 900, backside 720, frontside 540 combo on the last three jumps, but was soon knocked into second when Roopi – his own countrymen and the owner of a mean frontside 1440 – bumped him with a cab 900, backside 900, backside 540 combo and a clean rail line at the top. Roopi’s run set the standard with a 89.40 that wouldn’t be beaten all day. As conditions deteriorated throughout the day with gusting side-winds a few heavy-hitting young bucks attempted to knock Roopi from his perch including Zac Stone from Canada who was throwing nice doubles that he just couldn’t link up, and Nuutti Niemela – another Finnish rider – who threw a cab double cork 900 to backside 1080 double cork combi, but only ended up 4th, obviously because his style wasn’t exactly ‘hammers’. The judge’s score of 89.40 (out of 100) saw Tonteri walk away with 500 valuable TTR World Tour ranking points, $5,000 in prize money and a swag of prizes that included a state-of-the-art Nex5 Sony Camera. “It’s been a great day, the weather was great, the course was perfect and it’s nice to be in the final with another Finnish guy (Antti) in the same contest,” said Tonteri. The best local riders in the men’s field were NZ’s Milu Multhaup in 7th and Australia’s Nick Wood in 10th. Top 3 qualifier Scotty James didn’t start after tearing a muscle in his back last night while pole dancing. “It feels good to be the only Kiwi to make the finals, there’s some really good riders here … pretty inspirational,” said Milu. In the girls it was a survival of speed and wind. With less body weight to carry them in the marginal snow and windy conditions there more than enough knuckles delivered to the female field with bone-shattering force. By the siren there was never a doubt that current 2-time world Champion Jamie Anderson wasn’t on the top of the heap. And she did it with her trademark smooth style greasing the course with backside 360’s switch backside 540’s and a tan straight out of summer in Cali. She was last seen looking to sell her victory 2-litre bottle of Jagermiester immediately after the presentation to anyone with enough guts to step to the nightmare. 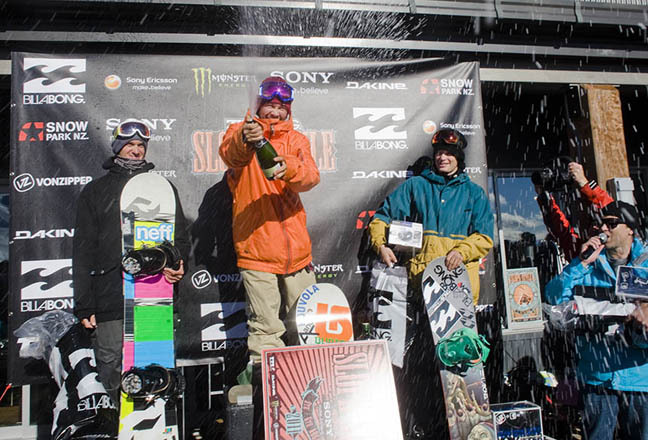 “To wrap up first place … I couldn’t be more excited,” said Anderson. “I’ve got my awesome new camera, a bunch of rad product and I’m just really excited to start off the season with a win. We have the New Zealand Open coming up next week and hopefully we’ll be shredding some pow in New Zealand.” Anderson said. In second place for the girls was Switzerland’s Isabel Derungs who was throwing down hard with technical trick combinations including some mean backside rodeo 540’s. Third place went to Jordi Karlinski from the USA. 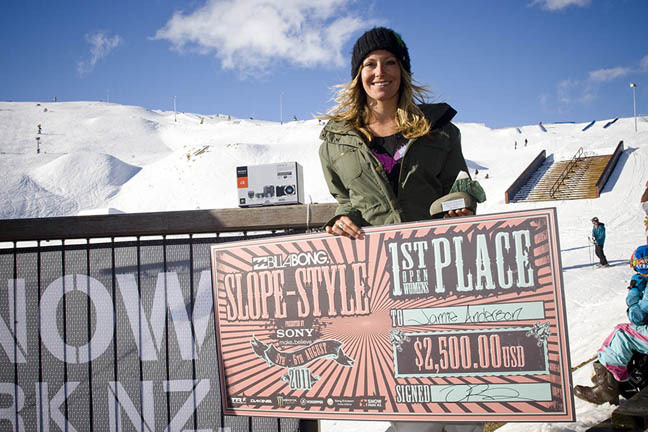 Current World Champion, Tahoe’s Jamie Anderson breezed to victory. 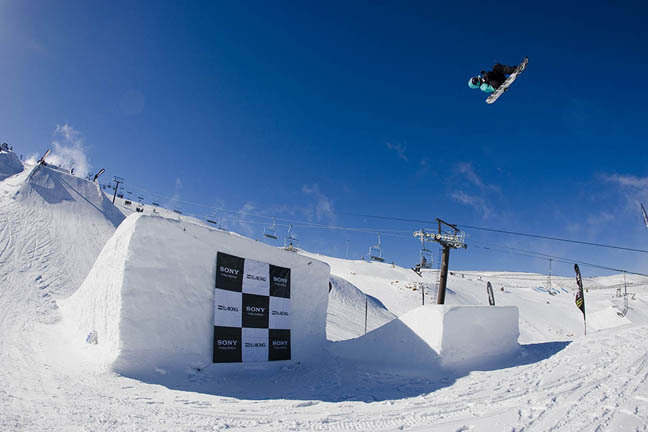 With the TTR World Snowboard Tour continuing its run next week over at Cardrona with the Burton NZ Open, followed by the NZ Winter Games and onto Australia for Stylewars in Falls Creek. The 2011 Billabong Slope-style marks the start of a run of jumps, rails, airs, cheques, shots, parties, moral dilemnas and many early-morning walks of shame for the world’s best snowboarders in the world, who are livin the dream and fighting for the end goal – overall TTR World Tour Champion – disease free. The TTR World Tour has a fresh ranking system in place for the 2011/12 season, which is designed to recognize the progression and specialization that has grown exponentially in snowboarding over the past 10-years. The new ranking system features three separate ranking lists for women (Overall, Slopestyle, Halfpipe) and four ranking lists for men (Overall, Slopestyle, Halfpipe and Big Air) that will make for a clear way to follow the different disciplines on the TTR World Tour throughout the season.